Remember the days you went to the carnival as a child? Click here to play! Sure, now that you've grown up the carnival has lost its magic, but for kids it is a highlight of the year. 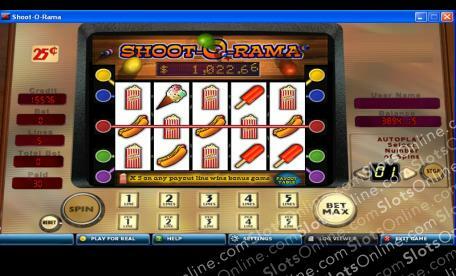 The Shoot-O-Rama slots try to bring back those memories of excitement. The symbols include fresh buttered popcorn, ice blocks, ice creams, hot dogs, colorful balloons and darts. It's all designed to remind you of the good times, while the big jackpot prizes that can be won are there to give you the same thrill you experienced when playing carnival games for a stuffed toy or a pet goldfish. Play the Shoot-O-Rama slots and have fun recalling all those times you threw a dart just right or hit a button with the right amount of force to win a prize. It's all the fun of a carnival in your home, without the crowds and with much better prizes to win! The Popcorn symbol triggers the bonus when 5 land on the same payline. In the bonus game, players choose a balloon to throw a dart at. A random prize is then awarded. The Popcorn symbol is very common, so the bonus game tends to be triggered on a regular basis.